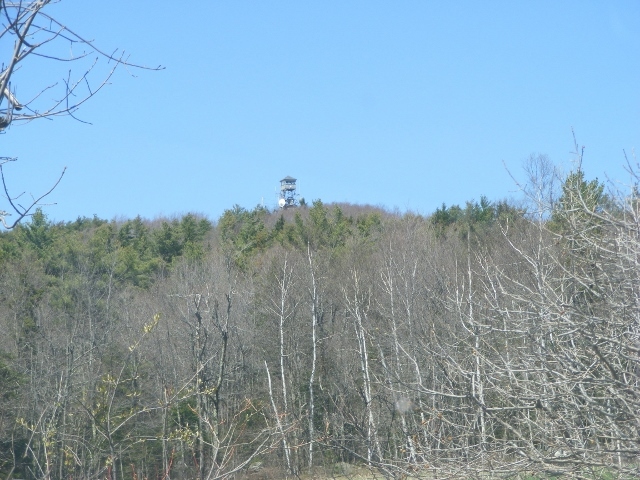 This decommissioned fire tower is a five-minute walk uphill from the parking lot at Stratham Hill Park on Route 33 in Stratham, New Hampshire. I paid it a quick visit on a sunny and clear fall afternoon. The view from Pack Monadnock’s summit was a treat even on this cloudy day. I hiked up via the Raymond Trail for the first time. The score is Ledge 1, Hiker 0 after a slight slip on the way down, and I keep a first aid kit in my pack for just such occasions. The hike was otherwise uneventful. Rocky stretches, but not as ledgy as the Wapack Trail up the mountain. Unlike the Wapack and Marion Davis trails, Raymond Trail doesn’t start from the Miller State Park parking lot. It goes up the west side of the mountain from a trailhead on East Mountain Road that has parking for three cars (maybe four in a pinch). 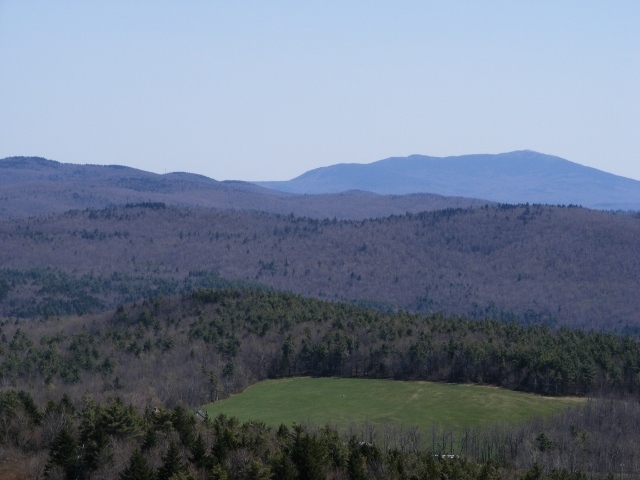 The Wapack Range stretches to the south, with the ridge of Temple Mountain in foreground. View to North Pack Monadnock. An auto road reaches the tower site at Miller State Park (Pack Monadnock). The white addition to the trail sign is an invitation to come to the Pack Monadnock summit for September’s raptor watch. Coming from Manchester via NH 101: drive west through Milford, Wilton, and Temple. Take a right at Mountain Road, about 0.2 mile past the Miller State Park entrance. Mountain Road becomes East Mountain Road. The trailhead is on the right, about a mile off of 101. When was the last time I got to one of New Hampshire’s fire towers? Was it Kearsarge or Pawtuckaway? It’s been awhile, at any rate. The other day, everything came together for another tower expedition: perfect weather, access to a car, and an afternoon to myself. I took a beautiful drive to Stoddard for a visit to Pitcher Mountain. It’s not much of a hike – only ten or fifteen minutes from parking lot to tower. The 360º views are splendid, though, and the drive was a treat. Dozens of miles on roads with no traffic signals and not a single Dunkin’ Donuts in sight: how’s that for a Sunday drive? I couldn’t miss the small parking lot on Route 123 on Stoddard. There’s a sign, but there’s also a view of the tower from the road. First peek at the tower, approaching from the east on Rt. 123. The walk uphill from the parking lot through woods suddenly opens up to a field with a fine view of Monadnock to the south. Mt. Monadnock in the distance, seen from the path to the Pitcher Mountain fire tower. From the tower, there was a full panorama on a nearly cloudless day. 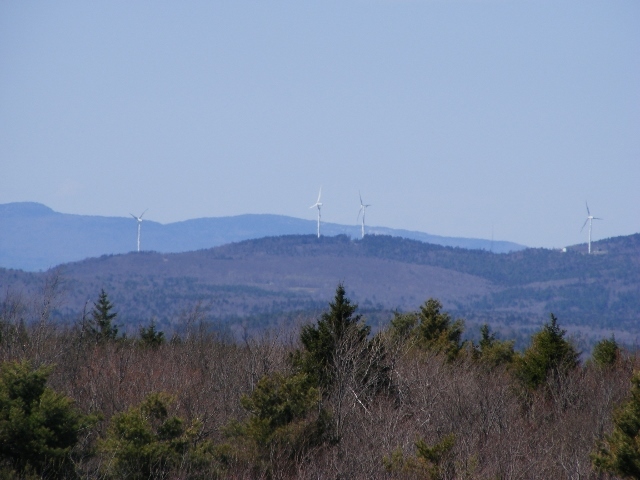 Monadnock is the most prominent feature, but plenty of other peaks are visible as well. I had the second edition of Hiking the Monadnock Region (a fine guidebook by Joe Adamowicz) to help me identify some of them. One of the most interesting local publications in my collection is a little orange booklet called A Field Guide to New Hampshire Firetowers by Iris W. Baird and Chris Haartz (2002). Look for used copies online. The booklet includes a short history of all the currently operating towers in the state, along with notes on other towers that are still standing but have been decommissioned. 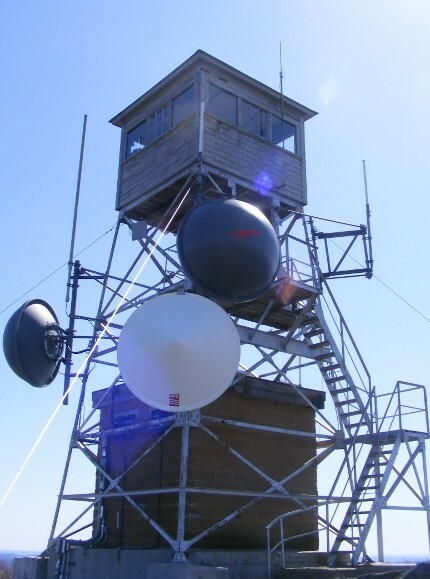 The New Hampshire Division of Forests and Lands has a web page, including information on the Tower Quest program: visit five fire towers to earn a patch. Fun for kids. I admit I have one of those patches myself. Given a complimentary pass to Deerfield Fair, I decided to enjoy not only the fair but also nearby Pawtuckaway State Park. It’s early fall, cool but not yet cold. The leaves are just beginning to turn around here. 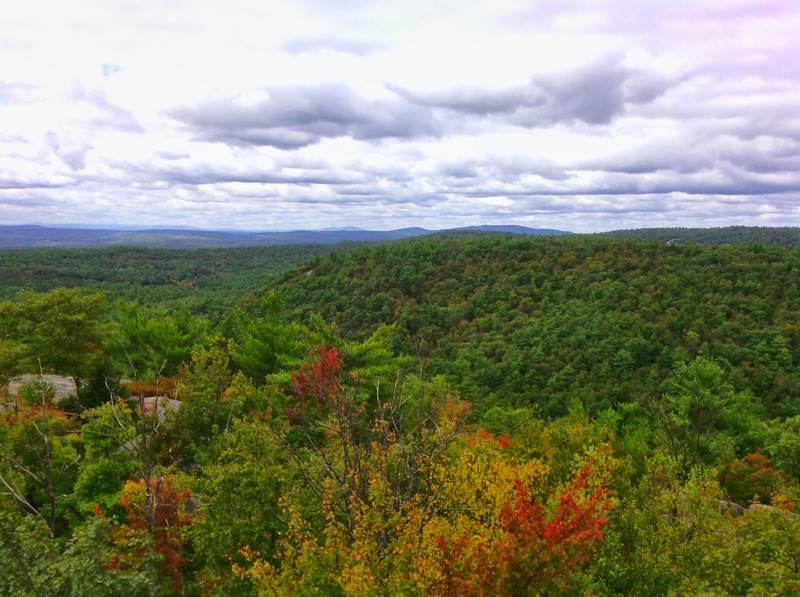 It’s less than an hour’s walk from the quiet northwestern edge of the park to the fire tower on south Pawtuckaway peak. 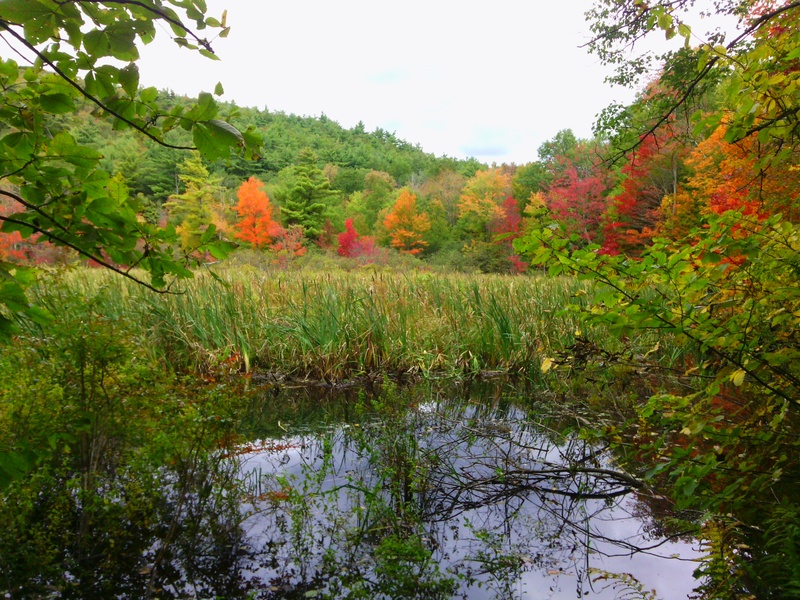 First fall colors at the edge of wetlands on Tower Road. I hiked in from the northwest corner of the park on Reservation Road, far from the busy main entrance. 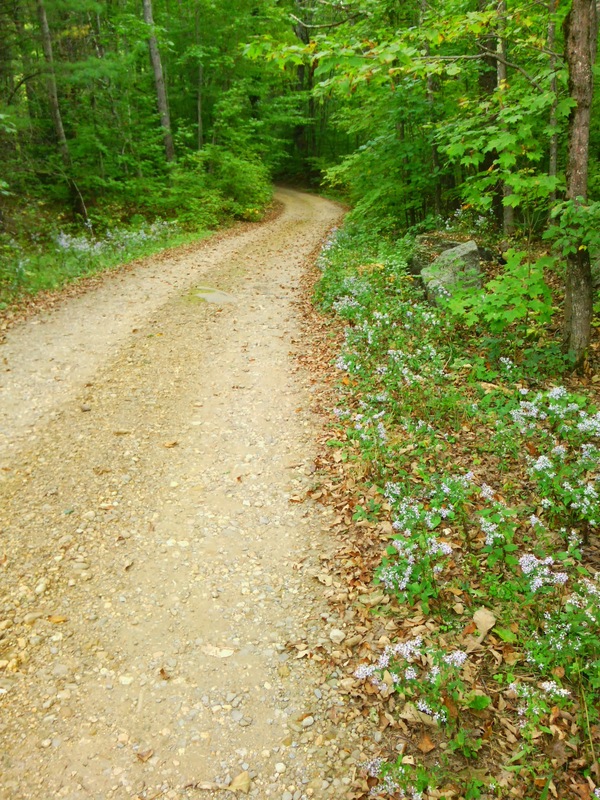 The little blue asters were the only blooms in sight. 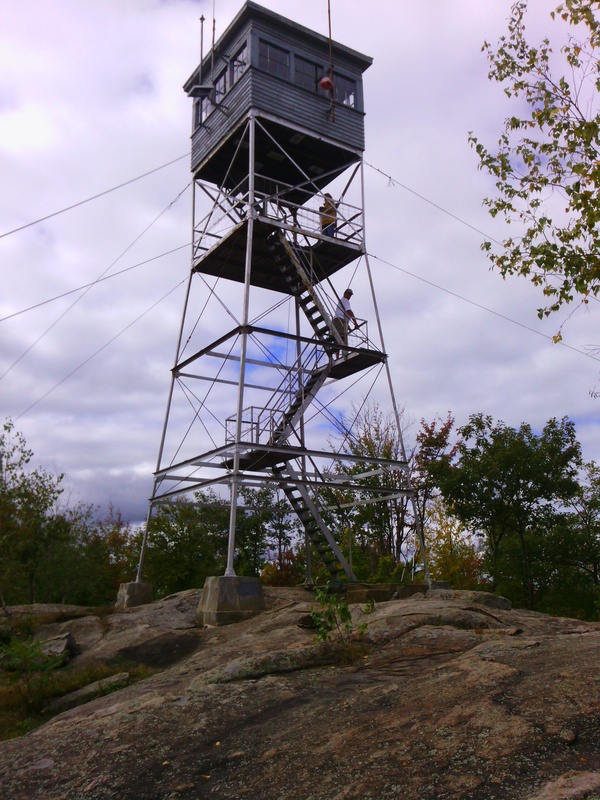 Pawtuckaway fire tower. Barely visible on the underside of the cab are charts describing the landmarks in each direction. 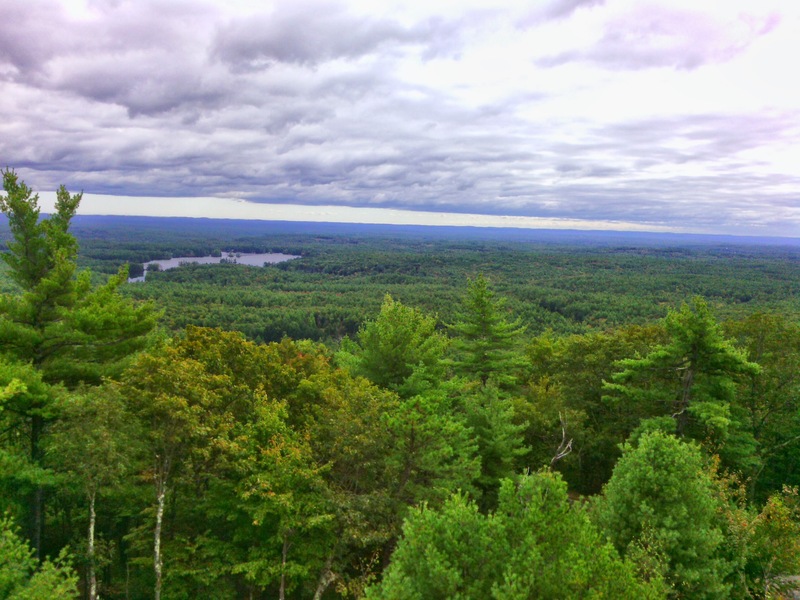 View from fire tower east to Pawtuckaway Lake and the Seacoast. View to northwest; Mt. Kearsarge is barely visible in the distance at center. I was upstate on this cold and crisp and splendidly clear day. This panorama was taken from the summit of Mt. Prospect at Weeks State Park, looking east to southeast. The snowiest peaks are of course the Presidentials, with Mt. Washington the rightmost peak in that group.